Great news! Worcester Bosch now come with up to 10 years guarantee. All Greenstar gas-fired CDi boilers installed by Smiths Heating Services Ltd will now receive a 10 year guarantee, if fitted with Worcester controls, or a Worcester cylinder and a Worcester filter. In addition to this, Worcester Si models enjoy a 9 years guarantee subject to the same conditions. Ri and I-system boilers can have up to an 8 years guarantee. The seven year extended guarantee has now also been extended to Greenstar oil boilers. 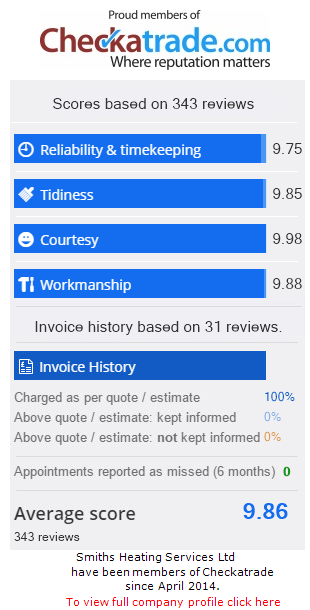 We are a small family business and we pride ourselves on having a first class reputation for quality workmanship and customer service. Over 90% of our work comes from referrals! We don’t just want to fit a new boiler, we want to build a long-term relationship with customers and have many customers that have used us again when they have moved house. We are also a Worcester Accredited service partner and as such, hold a stock of Worcester Bosch Genuine parts. We offer boiler replacements (Gas, oil and LPG), full central heating installations, radiators and underfloor heating. We install solar panels and heat pumps and have experience of integrating solar with various types of systems. We also offer Power flushing and service and maintenance of heating and hot water systems as well as general plumbing work. We specialise in the maintenance of Worcester Bosch boilers, but also service and repair other makes.